E-KABIN 0 Series Monoblock Enclosure Overlapping Door, Wall Mount Enclosure For Electrical Housing Applications. – Cabinet Thickness: 1mm from 250×200 to 800x800mm cabinets, 1.5mm from 900×600 to 1000x800mm and 1200×600 to 1200x800mm cabinets, 2mm from 1000×1000 to 1200x1200mm cabinets. – Door Thickness: 1mm from 250×200 to 800x800mm and 900×600 to 1000x600mm cabinets. – Epoxy-polyester powder paint RAL 7035 wrinkled as standard, 60 – 80 u. – Standard Supply Contents: Wall mounting brackets for all sizes, earthing continuity cable for all sizes, embedded plastic lock type for single doors, swing handle with rod mechanism for overlapping doors, bottom gland plate for all sizes. 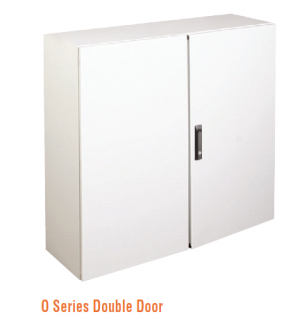 – Protection IP66 (single door), IP54 (double door). – Standard door opening 125 degrees, the door can be opened 180 degrees with the optional hinge set. 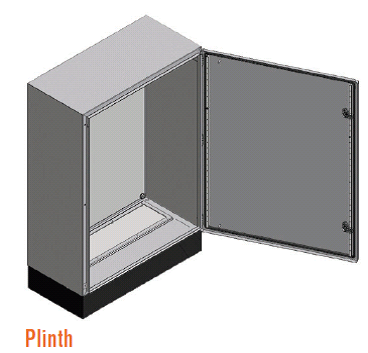 – Optional glazed door, inner door, plinth, plan pocket, castor. – Type-Tested according to IEC 62208-1/2 (KEMA – DEKRA). 19E08010030D Double door enclosure IP54, 800H x 1000W x 300D mm, 1 lock, mounting plate 723.6 x 923.6mm, 50.42kg. 19E08012040D Double door enclosure IP54, 800H x 1200W x 400D mm, 1 lock, mounting plate 723.6 x 1123.6mm, 56.23kg. 19E010010030D Double door enclosure IP54, 1000H x 1000W x 300D mm, 1 lock, mounting plate 923.6 x 923.6mm, 64.80kg. 19E010010040D Double door enclosure IP54, 1000H x 1000W x 400D mm, 1 lock, mounting plate 923.6 x 923.6mm, 66.03kg. 19Eo12010030D Double door enclosure IP54, 1200H x 1000W x 300D mm, 1 lock, mounting plate 1123.6 x 923.6mm, 76.15kg. 19E012010040D Double door enclosure IP54, 1200H x 1000W x 400D mm, 1 lock, mounting plate 1123.6 x 923.6mm, 81.90kg. 19E014010040D Double door enclosure IP54, 1400H x 1000W x 400D mm, 1 lock, mounting plate 1323.6 x 1123.6mm, 100.05kg. 19E00B10060 Inner door kits for single door 0 series enclosures, 1000H x 600W mm, enclosure size – E0 100 60 20 / E0 100 60 25 / E0 100 60 30. 19E00B10070 Inner door kits for single door 0 series enclosures, 1000H x 700W mm, enclosure size – E0 100 70 20 / E0 100 70 25 / E0 100 70 30, E0 100 70 40. 19E00B10080 Inner door kits for single door 0 series enclosures, 1000H x 800W mm, enclosure size – E0 100 80 30 / E0 100 80 40. 19E00B12060 Inner door kits for single door 0 series enclosures, 1200H x 800W mm, enclosure size – E0 120 80 20 / E0 120 80 30 / E0 120 80 40. 19E00B12080 Inner door kits for single door 0 series enclosures, 1200H x 800W mm, enclosure size – E0 120 80 30 / E0 120 80 40. 19E00B4040 Inner door kits for single door 0 series enclosures, 400H x 400W mm, enclosure size – E0 40 40 20. 19E00B5035 Inner door kits for single door 0 series enclosures, 500H x 350W mm, enclosure size – E0 50 35 15 / E0 50 35 20. 19E00B5040 Inner door kits for single door 0 series enclosures, 500H x 400W mm, enclosure size – E0 50 40 20. 19E00B6040 Inner door kits for single door 0 series enclosures, 600H x 400W mm, enclosure size – E0 60 40 20 / E0 60 40 25 / E0 60 40 30. 19E00B6050 Inner door kits for single door 0 series enclosures, 600H x 500W mm, enclosure size – E0 60 50 20 / E0 60 50 30. 19E00B6060 Inner door kits for single door 0 series enclosures, 600H x 600W mm, enclosure size – E0 60 60 20 / E0 60 60 25. 19E00B7050 Inner door kits for single door 0 series enclosures, 700H x 500W mm, enclosure size – E0 70 50 20 / E0 70 50 30. 19E00B8060 Inner door kits for single door 0 series enclosures, 800H x 600W mm, enclosure size – E0 80 60 20 / E0 80 60 25 / E0 80 60 30. 19E00B8080 Inner door kits for single door 0 series enclosures, 800H x 800W mm, enclosure size – E0 80 80 30. 19E0BZ6030 Plinth for 0 series enclosures, 600W x 300D mm, enclosure size – E0 60 60 30 / E0 80 60 30. 19E0BZ8030 Plinth for 0 series enclosures, 800W x 300D mm, enclosure size – E0 60 80 30 / E0 100 80 30 / E0 120 80 30. 19E0BZ10030 Plinth for 0 series enclosures, 1000W x 300D mm, enclosure size – E0 100 100 30 / E0 120 100 30. 19E0BZ10040 Plinth for 0 series enclosures, 1000W x 400D mm, enclosure size – E0 100 100 40 / E0 120 100 40 / E0 140 100 40.